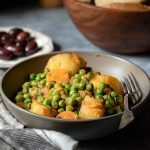 In Greece, this pea and potato stew is served as a main course, especially during times of Lent. It belongs in the “Lathera” category, which means “cooked with oil”. And when we say oil, we almost always mean olive oil. However, if olive oil is pricey where you live you can certainly use half olive oil and half of another vegetable oil like corn or sunflower oil. If you’re interested for more Lenten or vegan recipes, make sure to also check this Mediterranean green bean stew with potatoes, and if you have a sweet tooth (like me) you’ll definitely want to try this fanouropita which is a vegan oil cake with a tahini chocolate ganache! This looks absolutely delicious. Its quite similar to Indian style Aloo Matar curry(aloo for potatoes and matar for green peas), but with the difference in the spices used. I am sure this goes really well with naan!!! Thank you Akhila! It definitely goes well with naan!